This article is about the film. For the figure in Arthurian legend, see Fisher King. The Fisher King is a 1991 American comedy-drama film written by Richard LaGravenese and directed by Terry Gilliam. Starring Robin Williams and Jeff Bridges, with Mercedes Ruehl, Amanda Plummer, and Michael Jeter in supporting roles, the film tells the story of a radio shock jock who tries to find redemption by helping a man whose life he inadvertently shattered. The film was released in the United States by TriStar Pictures on September 20, 1991. It was a critical and commercial success, grossing $42 million on a $24 million budget. Jack Lucas, a narcissistic, misanthropic shock jock, becomes suicidal and despondent after his insensitive on-air comments inadvertently prompt an unstable caller to commit a mass murder-suicide at a Manhattan restaurant. Three years later, Jack is working for his girlfriend Anne in a video store in a mostly drunken, depressed state. One night, while on a bender, he contemplates suicide. However, he is attacked and nearly set on fire by thugs who mistake him for a homeless person. He is rescued by Parry, a deluded homeless man who claims his mission is to find the Holy Grail. Jack is initially reluctant but acquiesces after learning that he is partially responsible for Parry's current condition. Parry, whose real name is Henry Sagan, had been a teacher at Hunter College. After witnessing his wife's gruesome death at the same mass shooting Jack had provoked, Henry had a psychotic break and became catatonic. When he woke, he had taken the persona of Parry and became obsessed with the legend of the Fisher King. With Parry as his shielding persona, mentions of reality panic him and he is continually haunted by a terrifying, hallucinatory Red Knight. Jack seeks to redeem himself by helping Parry find love again. Lydia, a shy woman with whom Parry is smitten, is prodded into meeting Parry and joining Jack and Anne for a dinner date. Following dinner, Parry walks Lydia home and declares his love for her; she reciprocates, but the brush with reality summons the Red Knight. Fleeing his hallucinatory tormentor, he is attacked by the same thugs against whom he had defended Jack. Beaten mercilessly, Parry becomes catatonic again. Jack, feeling whole again after 'saving' Parry, breaks up with Anne and begins to rebuild his career, but has a crisis of conscience during a sitcom pitch after snubbing a vagrant who had previously done him a favor. After finding out what happened to Parry, Jack dons Parry's clothing and infiltrates the Upper East Side castle of a famous architect and retrieves the "Grail", a trophy which Parry believes to be the real Grail. During the theft, Jack finds the architect unconscious after an attempted suicide. He triggers the alarm when leaving, alerting the authorities and saving the man's life. When he brings the Grail to Parry, the catatonia is broken and Parry regains consciousness. Lydia comes to visit Parry in the hospital; she finds him awake and leading the patients of the ward in a rendition of "How About You?" with Jack. Parry and Lydia embrace. Afterwards, Jack reconciles with Anne, telling her that he loves her. She slaps him, but then grabs and kisses him. Later, Jack and Parry lie naked in Central Park gazing at the clouds. During an appearance on The Directors (which is available on the 2-Disc DVD for Gilliam's film Time Bandits), Gilliam said he wanted to do the film because he was tired of doing big budget special effects films, such as his previous film The Adventures of Baron Munchausen, which went over budget and cost over $45 million, nearly twice as much as The Fisher King's budget of $24 million. This was the first film Gilliam directed in which he was not involved in writing the screenplay, as well as his first film not to feature any other members of Monty Python. It is Gilliam's second film involving the Holy Grail, the first being Monty Python and the Holy Grail. According to the Directors episode, Gilliam came up with the scene where Robin Williams and Amanda Plummer meet during a huge waltz in the middle of Grand Central Terminal, because he felt the scene LaGravenese had written (which had a large group of people in a crowded subway listen to a homeless woman sing with a beautiful voice that fills the room) wasn't working. He was at first hesitant about this because his original intentions were to just shoot the script, and that the waltz would make it "a Terry Gilliam film". The scene was shot in one night with a mix of professional extras and passengers getting off the train. The film did moderately well at the box office, with revenue of approximately $42 million. 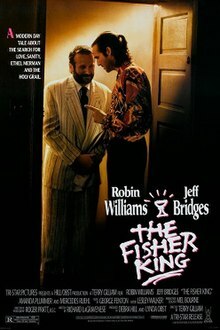 The Fisher King received positive reviews. Peter Travers of Rolling Stone wrote that the film "sweeps you up on waves of humor, heartbreak and ravishing romance". On Rotten Tomatoes it has an approval rating of 82%, based on 57 reviews, with an average rating of 6.9/10. On Metacritic the film has a score of 61 out of 100, based on reviews from 9 critics, indicating "generally favorable reviews". The film was released on VHS and Laserdisc by Columbia-TriStar Home Video in 1992. The 1st Laserdisc release was a full-screen pan and scan transfer only, but showed more vertical information while losing horizontal info. The 2nd release in the 1997 Widescreen Collection presents it in its theatrical ratio of 1.85:1, in which the same master was used for the 1998 DVD release. The Criterion Collection released their Laserdisc version in 1993 with several extras that have not surfaced on any other release, and a director approved widescreen transfer in 1.66:1 (presumably the ratio it was shot in). The film was released in 1998 on DVD by Columbia-TriStar Home Video, and its transfer was essentially a port of the previous 1997 laserdisc with no extra features aside from the theatrical trailer. This release is one of the oldest DVD titles to still remain in print as of 2014. In 2011, Image Entertainment (under license from Sony Pictures Home Entertainment) released a Blu-ray utilizing a new HD master in the theatrical ratio of 1.85:1, with Dolby Digital Tru-HD 5.1 surround (all other releases were in 2.0 surround). This release is essentially bare bones, and does not have the trailer like the previous DVD release had. On June 23, 2015, The Criterion Collection re-released the film on Blu-ray and DVD. ^ Fox, David J. (1991-10-29). "Weekend Box Office `House Party 2' Takes Top Spot". The Los Angeles Times. Retrieved 2011-01-01. ^ Fox, David J. (1991-10-31). "Terminator 2 About to Hit $200-Million Mark : Movies: While fall releases are in box-office slump, the summer smash climbs to 13th on all-time domestic ticket sales list". The Los Angeles Times. Retrieved 2011-01-01. ^ "The Fisher King > Overview". AllMovie.com. Rovi Corporation. Retrieved 2010-10-22. ^ Travers, Peter (September 20, 1991). "The Fisher King". Rolling Stone. Retrieved June 15, 2018. ^ "The Fisher King Movie Reviews". Rotten Tomatoes. Fandango Media. Retrieved 2017-10-21. ^ "The Fisher King (1991)". The Swedish Film Database. Retrieved 18 March 2014.